It took me a long time, about 27 years, to finally find my healthy stride and to commit to a healthy lifestyle forever. Hopefully, sharing my journey may inspire and help someone else who struggled to get there, like I did. I’ve written several posts on the topic of a healthy lifestyle. If you’re looking for extra inspiration (and have some time blocked off), you’ll enjoy reading through these posts. Whether it’s 2pm and you’re at work staring at your monitor, or it’s 10pm and you’re laying in bed, whether it’s Sunday or Wednesday or Friday, the first step is this: START. I love the saying, “an expert was once a beginner.” You have to start and there’s no better time than the present. And in that same vein, you have to know that you’re not going to start off and immediately be your healthiest you (just like a beginner won’t start and right away become an expert.) It’s going to take time and it’s going to be a JOURNEY. Don’t expect overnight results. This isn’t a 3-day cleanse that helps you lose a couple pounds of water weight before your high school reunion. This isn’t even something that by the end of the week, you can fit into that new party dress you bought. This is about feeling good in your own skin, finally. I truly believe that you glow from the inside out and if you nourish your body properly, you’ll feel good AND look good. This is about never having to say, “Ugh, I need to go on a diet!” OR never having to feel anxiety about fitting into a bathing suit, scrambling to lose weight before summer starts. So, once you start, acknowledge that for the rest of your life, you are going to choose (most of the time – more on that below) to eat healthy. You are going to choose this because you want to feel good. You don’t want to feel lethargic anymore or feel food guilt. You want to be able to eat what you want, but still look good. First, start. Commit. Decide that you’re choosing balance over restriction, always. Stock your pantry and fridge with healthy foods. I have lists in all of my cookbooks on what to keep in your pantry and fridge for healthy eating. Ditch the Domino sugar for organic coconut sugar. Love chocolate chip cookies after dinner? Try Simple Mill’s Chocolate Chip Crunchy Cookies. NEED to have cream cheese with toast in the morning? Snack on Cheez-Its or have a little kid in the house who loves them in their snack pack? Try Simple Mills’ Farmhouse Cheddar Crackers. There is literally a healthier alternative for every type of food out there, so stock your pantry right, and when you reach in for a craving, at least you’ll be eating something that’s made with real, whole ingredients and will nourish your body while satisfying a sweet or salty tooth! I find this fun – it’s a big ‘ole trip to the grocery store that feels cathartic! If you need to set a goal to keep you on track of the lifestyle, don’t make it a materialistic one. Don’t say, “That’s it! I finally want to be a size 4, I’m starting a healthy lifestyle!” This healthy lifestyle should be all about simply feeling good. There’s no better feeling than waking up and having energy, feeling alive, and yes, fitting into your favorite jeans. But the second you get home, you throw on comfy sweats, so what’s the point, right? If you want to set a numerical goal, make it something like, “I’m going to eat X amount of servings of veggies each day” or, “I’m going to be able to do X amount of burpees by the end of the month.” And if you HAVE to set a weight loss goal (I did at first), understand that it’s just one stepping stone in a lifestyle, not a stopping point or an “end” goal. Set yourself up for success with planning. “Ugh, I had a donut for breakfast because I was starving and had to hop into a 3-hour long meeting!” If you’re having a donut because it was voted the world’s best donut and you just really, really want to try it, that’s one thing. BUT if you’re grabbing a donut because you forgot to pack a healthy protein bar or throw together a breakfast before you ran out the door, that’s another thing. Part of the lifestyle is fitting healthiness into every part of your day. So, set yourself up for success by meal planning and making sure that you have grabbable, healthy, satisfying snacks around – whether at your desk at work, in your purse, or gym bag, set yourself up for success! Don’t do everything at once. Don’t setup an intense, 6-day a week workout program along with a total overhaul of your diet. Try eating healthy first and building in some low intensity workouts a few days a week. Don’t try to do it all, it’ll result in burnout and if you’re doing it all and not seeing immediate results, it can be discouraging. Be kind to your body and keep remembering, this is FOREVER, not just a specific amount of time. There’s no rush! Accept that yes, while you can’t eat whatever you want 24/7 anymore, you will still be able to have your favorite foods. Since you’re committing to a lifelong journey of healthy eating, one night of having a slice of chocolate cake won’t derail you. If you were on a diet, it would, but if you’re committing to the overall picture, it’s just one small smidge. So when you commit to this lifestyle, you won’t feel guilty about indulging. Keep this in the back of your mind at all times, especially when you’re about to make a very unhealthy choice: will this make me feel good? Will the bloated, exhausted, thirsty feeling you get after eating something unhealthy be better than the alternative, which is having energy, glowing, and being confident in your own skin? Usually, it won’t be. Honestly, unless I’m having some uncontrollable craving or I’m participating in something special (a celebration, an event, etc), I do my best to skip the temptations. For example, if I’m at a wedding, I’ll have as much of the wedding cake as I want. Usually, all I need is a few bites – because I know that if I eat the whole slice (and a bite of Lu’s), I won’t feel good on the dancefloor for the rest of the night, and it’s just not worth it. Now I’m not saying you have to think about every single food decision you make, because it gets easier once you hit that healthy stride, but at first, it helps to just be more conscious of your food decisions. Tell everyone about it – and NEVER feel bad about making a healthy choice while out with friends or family. This one gets me every time – someone asking me, “What do you do when you go out to dinners with friends? I’m always looked at funny if I don’t eat what they eat or want to share appetizers.” Just like people who make fun of the Kardashians, they’re laughing all the way to the bank. So what do you care if a friend gives you a stank face for not having a piece of bread or wanting to split artichoke dip with them? You’re trying to feel your best – and every single dinner with a friend isn’t an excuse to go HAM, especially if you’re a social person and like to go out a lot. When I first started my healthy journey, I was “that” girl who didn’t have dessert or didn’t partake in fried apps. When I told my friends about my new goals, they simply said, “Ugh, you’re so good, I wish I could be as good as you!” to which I’d respond, “You can too!” Don’t you want to be a positive influence on your friends? And plus, I’d rather have another glass of wine than a mozzarella stick. But that’s just me. Always evolve. There are going to be times in your life when your body is different and your life is different. Case in point: I got pregnant! I went from knowing how much food I needed to fuel myself and what extra treats I could indulge in without compromising my healthy lifestyle and THEN I started growing a human inside of my tummy! I had to eat more, and I was clearly going to gain weight – like, a lot of weight. I gained about 35 pounds! Did I just say, “Eff it, what’s the point? !” No – I did the exact opposite. I focused on being even HEALTHIER, for three reasons: 1) to keep my baby healthy and nourished, 2) to have energy and feel good while pregnant so I would enjoy my pregnancy, and 3) be able to snap back into shape post-partum. Just accept that your life is going to go in all sorts of directions (pregnancies or not) and you need to accept that. You may go through a really bad breakup or mourn the loss of a loved one (something I also had to go through last year) where you may turn to food for comfort or not have the energy to stick to your fitness regimen. THAT’S OKAY. Everything is going to be okay, because again, in the grand scheme of things, a few months (or nine) where you’re adjusting your eating and exercising patterns won’t cause you to fall off the wagon, if you do your best to keep healthy and be kind to yourself. Keep it 80/20. I’ve talked about this 80/20 rule ad nauseum, and I’ll say it again: eat clean and well 80% of the time, and let yourself enjoy some Oreos or skip a workout 20% of the time. By doing this, you’re giving yourself flexibility and you’re not being too restrictive, leading into compulsive behavior, food anxiety, and potentially, eating disorders. Personally, I don’t label my diet and I don’t totally eliminate any foods (I choose not to keep some foods in my house, to eliminate 24/7 temptation, but I’ll have them outside of my home, during the 20%.) For example, your 80% of the time might be Monday through Saturday OR your 80% of the time may be random – like a special event you know is coming up OR a spontaneous date night in with your boo after a rough day at work. You never want to feel persecuted by your lifestyle and allowing this 20% of flexibility makes it more sustainable and thus, a healthy lifestyle. And take it from someone who has struggled for 27 years, found a healthy lifestyle, found her “goal weight”, then got pregnant, had a baby, and is getting back into shape post-partum, the 80/20 rule works! And if you start to see that ratio shift to 70/30, 60/40, just reset. Rein it back in. I hope these tips get you inspired to make some healthy changes in your lifestyle! Now remember when I said to stock your pantry with healthier alternatives of your favorite snacks and sweets? Well, here’s a perfect example of that, using the universal “guilty pleasure” food: PIZZA! 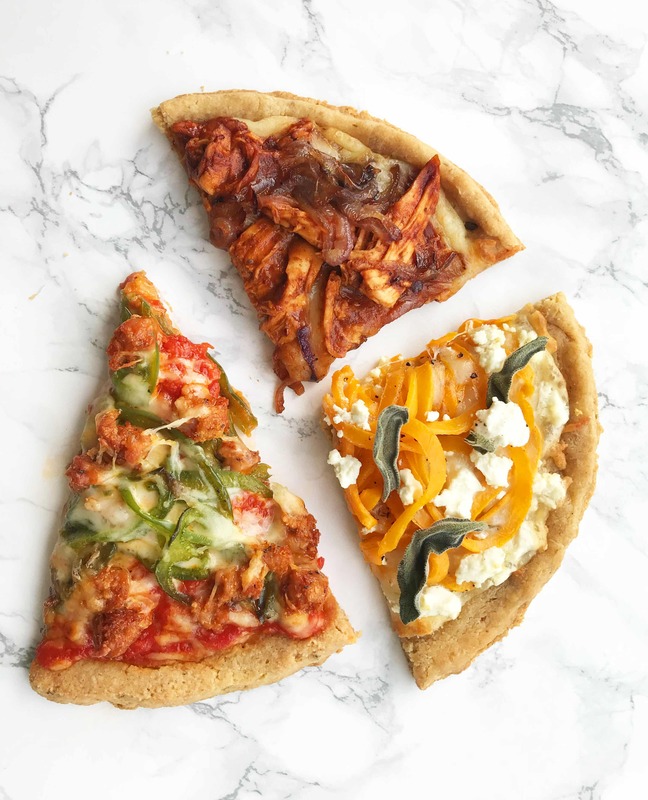 Using Simple Mill’s Almond Flour Pizza Dough and the Inspiralizer, I’ve made three different pizzas, using three different topping varieties: BBQ Chicken and Caramelized Onion, Spicy Chicken Sausage and Peppers, and Goat Cheese and Butternut Squash. 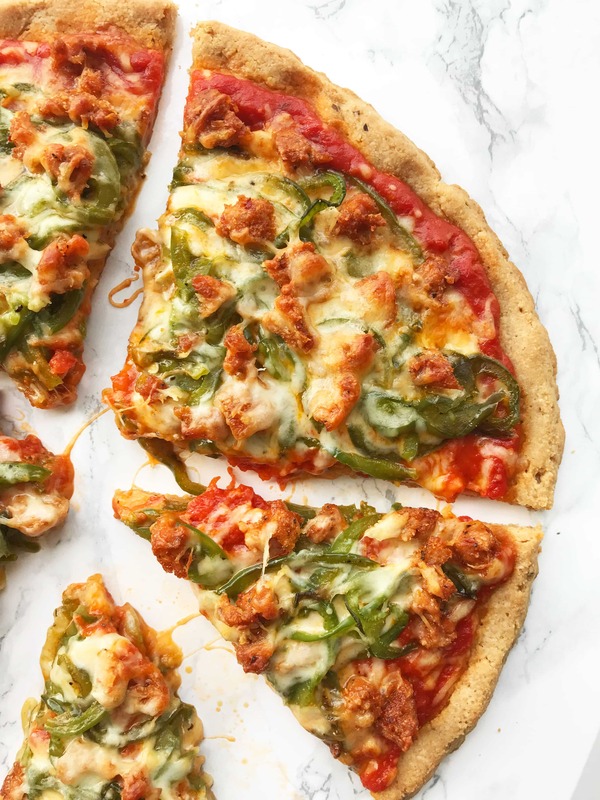 Instead of eating a pizza dough made with sugar, flour, additives and other chemicals, you’re eating eight REAL ingredients: Almond Flour, Arrowroot, Flax Meal, Cauliflower, Baking Soda, Organic Oregano, Cream of Tartar, Organic Garlic. These are ingredients that will nourish your body! It’s a win-win! In all honestly, after making these pizzas last week, I said to my mother (who devoured them alongside me! 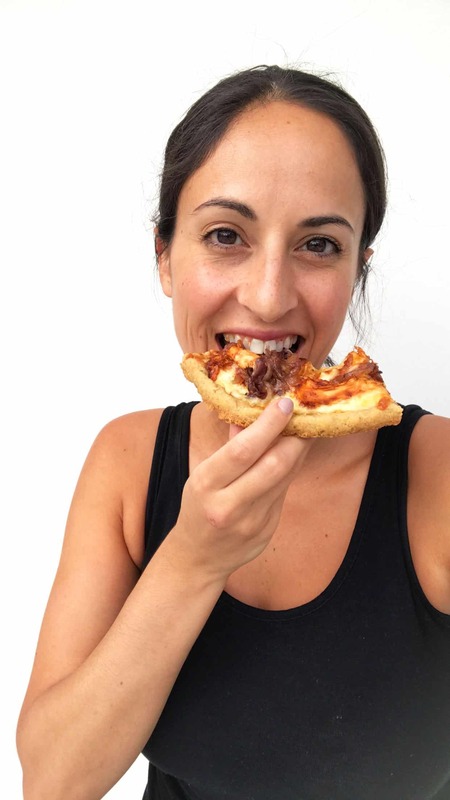 ), “I don’t think I’ll ever miss pizzeria pizza again!” Of course, there’s a time and a place for pizzeria pizza (like date nights, etc! 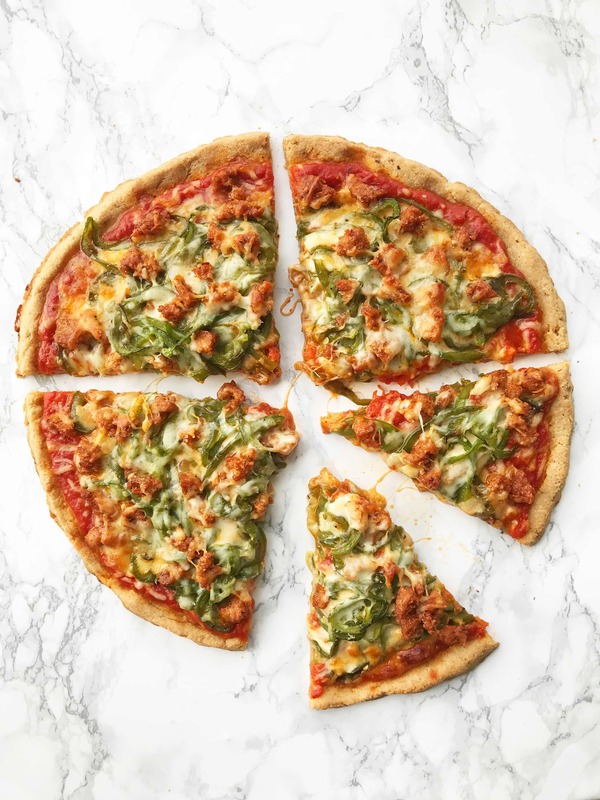 ), but honestly, this Simple Mill’s Almond Flour Pizza Dough is spot-on – it gets crispy and holds together perfectly (which is hard to come by with premade gluten-free crusts!) I can’t wait to make these for Lu when we’re back in Jersey City together. And of course, I can’t wait to make one for Luca one day, when he starts eating real foods! The doughs were easy to make – just whisk together apple cider vinegar, water, and oil and then add the mix! I made two 8-inch pizzas and then one larger pie and all three came out so well! My parents and I devoured the pizza for dinner with a big side salad. The best part? 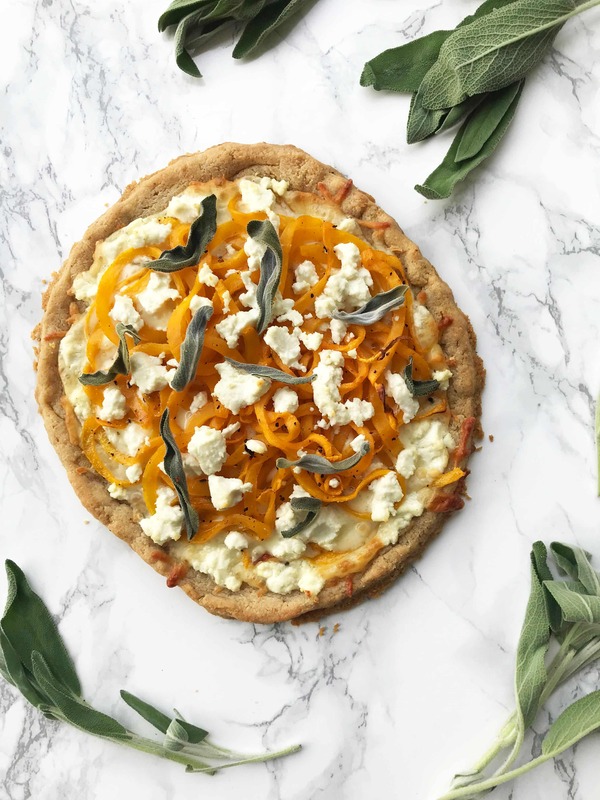 These pizzas fit into my overall healthy lifestyle – a wholesome pizza crust paired with a good old fashioned cheesy topping! Total balance. And I woke up feeling great! You can find these mixes at Whole Foods! Note: Although Simple Mills sponsored this post, all opinions are my own, always. Place the chicken breast into a pot and cover with water. Bring the water to a boil and once boiling, reduce heat to medium-low and cook for 12 minutes or until chicken is cooked through and juices run clear. Remove from the water and shred with two forks. Add the chicken to a medium mixing bowl and pour over barbecue sauce and toss to coat. Set aside. Meanwhile, while chicken cooks, heat the oil in a medium skillet over medium-high heat. Once oil is shimmering, add the onions and season with salt and pepper. Let cook, tossing occasionally, until onions are caramelized, about 15-20 minutes. While onions and chicken cook, prepare the pizza dough. Prepare the dough according to package directions and create two crusts. Cook for 5 minutes in the preheated oven (per the package instructions). Then, top each crust with mozzarella cheese. 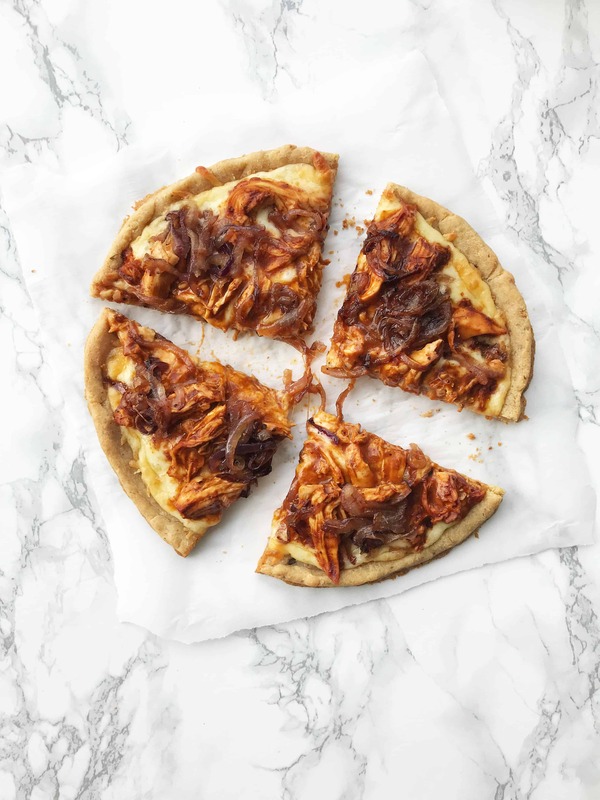 Then, top with BBQ chicken and caramelized onions. Pop both crusts into the oven and cook until crust is firm and browned, about 15 minutes. Remove from the oven and cut into four slices and serve. Place the butternut squash on the baking sheet, spritz with olive oil cooking spray, season with salt and pepper, and bake for 10-15 minutes or until soft and wilted, but still al dente. Once butternut squash is done, lower oven heat to 350 degrees. While butternut squash cooks, prepare the pizza dough. Prepare the dough according to package directions and create two crusts. Cook for 5 minutes in the 350 degree preheated oven (per the package instructions). Then, top each crust with mozzarella cheese. Then, top with butternut squash noodles and top with goat cheese, pushing it in between the butternut squash noodles and around the outer crust. Top with sage leaves. Pop both crusts into the oven and cook until crust is firm and browned, about 15 minutes. Remove from the oven, garnish with red pepper flakes, and cut into four slices and serve. Heat the oil in a large skillet over medium-high heat. Once oil is shimmering, add the chicken sausage, crumbling with a wooden spoon. Cook until cooked through, about 7 minutes. Remove the chicken sausage with a slotted spoon or tongs and immediately add in the bell pepper noodles and season with garlic powder, salt, and pepper. Toss occasionally until most wilted, 5 to 7 minutes. While bell peppers cook, prepare the pizza dough. Prepare the dough according to package directions and create one large crust (use all the dough). Cook for 5 minutes in the 350 degree preheated oven (per the package instructions). Then, top each crust with marinara sauce, leaving a little more than 1/4″ around the edges for the crust. Then, top with 3/4 of the mozzarella cheese. Then top with bell pepper noodles. Then top with chicken sausage. Then top with remaining mozzarella cheese. Pop the crust into the oven and cook until crust is firm and browned, about 20-25 minutes. Remove from the oven and cut into eight slices and serve. I ordered the Simple Mills Pizza Dough after looking at the pictures of your pizza. Your pictures look amazing. Thanks for the recipes. 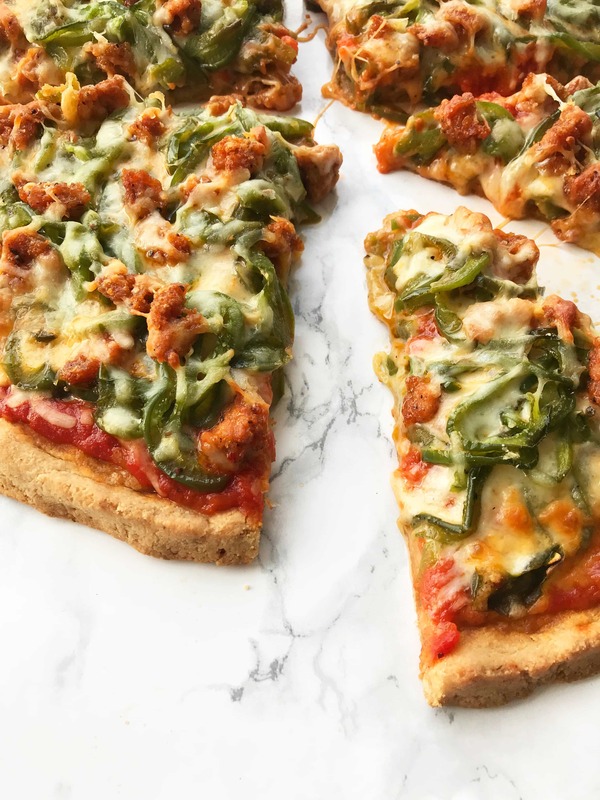 I will making the chicken sausage and bell pepper pizza this week. Yay, Jeanne! Hope they come out great! Yes yes yes . If people would follow these principles, the journey to health would be a whole lot easier . I agree 100% with everything you said here . Thanks Krysten, so glad to hear it resonated with you!! Hi Ali! What kind of oil did you use to make the pizzas? I think the box suggests grape seed or vegetable oil and you had said yours came out nice and crispy. I find that when I have everything prepped ahead of time and don't let myself get to the point where I'm starving, it's much much easier to stay on track. It's not always easy with my work schedule, but I totally agree that I feel so much better when I'm eating right and working out. These pizza crusts sound great - I largely avoid pizza because of the carb coma. Angela, you don't feel the carb coma with these, because of the ingredients in the crust -- they're low on the glycemic level and they're not made with glutinous flours, so you don't feel that same heaviness after you eat gluten. Hope you give them a try! Love everything you said! I’d appreciate your reviewing CALIFLOUR brand cauliflower pizza crusts. Can be found on their website and Amazon. No almond flour, a vegan version that does incl it, various flavors, premade and kept frozen, super clean. They are getting reading to launch a wrap, as well. Thanks for a great post! We're so glad you enjoyed it! I have been ordering and eating the cauliflower crusts from Cali-flour, and they are wonderful.... 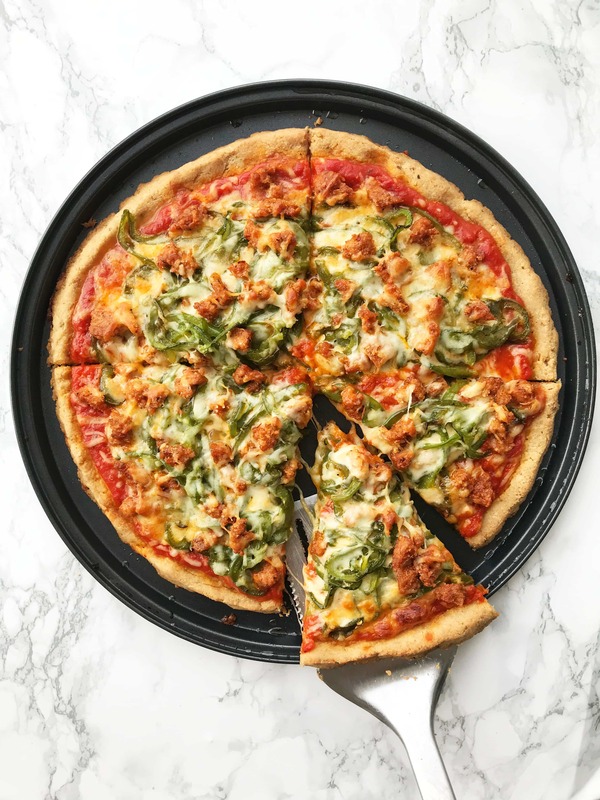 I am on a weight watchers journey and I can have the whole pizza crust with no points toppings for 6 points....I have tried to make the cauliflower crusts and each time they fail, so its worth the price for me to use theirs. I am happy to hear that others are using them also. Dear Ali, I found a nice recipe article on " Gluten-Free Pizza With Spiralized Toppings Three Ways" on your website. Surely I will love to try this recipe but I wish you could add a recipe video. by the way can you assist me about the food calories measurement of this recipe? Hi Wali! That's great! Thanks for the feedback. Because this is a sponsored post, we do not have nutritional information for this dish! We're sorry about that. 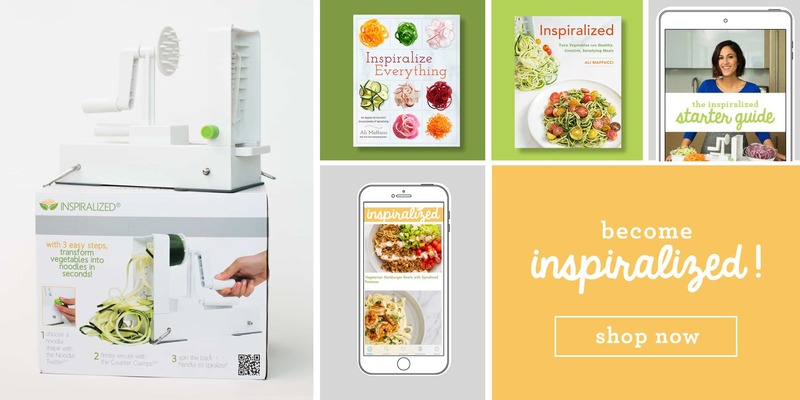 I love My Spiralizer, and have made many of your great recipes. Recently we had a problem with Butternut Squash. On the D setting, the noodles did not separate most of the time. Was this because the squash was fairly hard, as in unripe? How do I choose a ripe Butternut squash? Hi Merikay! I am so sorry to hear this. Shoot me an email - [email protected] - and I can help you troubleshoot! I tried to order a simple Mills pizza dough; they don’t ship to Germany. I couldn’t find a vendor through amazon who ships to Germany. We have some simple mills products here but not pizza dough. Such good, practical, DO-ABLE advice, which is so needed at this time of year!! Thank you once again, Ali!